I begin this article with Figure 1, which provides an overview of how mankind developed the belief in one-universal God. Few people have had the benefits of being taught history of ancient civilizations and it’s for certain that religious leaders of the Judaic, Christian and Islamic faiths have not instructed their followers about the beginnings of their beliefs. To learn how these religions developed their beliefs based upon facts and findings, I begin with an opening statement by Jesus Christ from Revelation 3:14, wherein he acknowledged Amen as the beginning of the creation of God. The words of Jesus are profound, albeit, a revelation that has not been acknowledged by Judaic, Christian and Islamic religious leaders. And yet, they and their followers announce Amen at the end of a prayer, supplication, giving thanks, asking for His protection in challenging times, and reverently sing His name in houses of worship. It is not my intent to alter your beliefs. 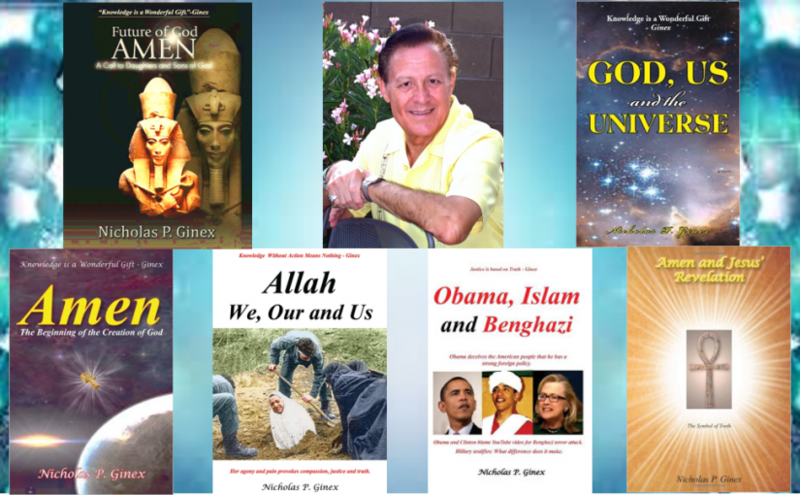 My objective is to inform and educate people about facts that have been surfaced by scholars of religion and highly respected Egyptologists. They have sacrificed their time and given their lives to surface facts and findings that religious institutions, through ignorance or intent, have not revealed to their followers. I take you back through the centuries to provide a history of one of the greatest civilizations built by mankind. In the lands of Egypt, along the Nile River, entered Africans who built homes, irrigation canals, pyramids, and temples where they worshipped many different gods. But it was through their beliefs in renewal of the Nile each year that evoked the wonder and veneration for those gods that enriched their lives. It would be an injustice for me to write in an article a history of how the Africans, later to be called Egyptians after the name of their country, developed the belief in many gods. They have left a legacy of advancing their multible god beliefs into one-universal God and establishing the first formal religion, which is documented on the walls of their temples, pyramids and obelisks. Referring to Figure 1, 2600 BCE, I introduce you to the hymn, The Creation by Atum. Major extracts of this hymn, as with the others that will be mentioned, are provided in the two books referenced above. Atum was the first god that created the first four gods of the Great Ennead (nine gods): Shu, god of air; Tefnut, god of moisture; Geb, god of earth; and Nut, goddess of the sky. The Priesthood advanced the idea that their city god Atum-Kheprer, who rose out of the waters of chaos (Nun), brought the first gods into being. This was a very perceptive concept that recognizes Atum as emanating from two important elements, the heat of the sun, associated with Kheprer and water, associated with Nun. The Egyptian mind was resourceful and reflective to include the gods of air (Shu) and moisture (Tefnut); for without the elements of air and moisture, life, as we know it, could not be sustained. By 1370 BCE, Amenhotep IV was the first pharaoh to break with the priesthood’s worship of multiple gods by transforming the sun god Amon-Re into a personal god named Aton, a god that creates and sustains life in all the earth. Re still was part of the dominate belief of the sun for life on earth but now was envisioned as waves of heat portrayed as emanating hands of life. Figure 2. Amenhotep IV (Ikhnaton) and Nofretete worshiping Aton. It was during the reign of Ramses II, circa 1270 BCE, that the Priesthood of Amon wrote, Amon as the Sole God. The ingenuity of the Egyptian Priesthood cannot be overlooked; with this hymn, they were able to establish Amon as the universal and sole god by advancing the belief that he came into being at the beginning, gave birth to Re and completed himself as Atum, a single body with him. They therefore closed the circle by linking Amon with Atum, the first Egyptian god; more than 1400 years later. But an observation needs to be made that it was only twenty years later, in 1250 BCE, that Moses walked out of Egypt extolling the one god belief. He wrote the Book of the Covenant, which preceded the development of the Torah, The Five Books of Moses, that were started in 950 BCE and finalized around 444 BCE by Erza and Nehemiah. Both referenced Amen books above present a detailed history of how the Egyptian Priesthood developed the first one-universal god belief and how people from other lands emulated that belief, which led to the formation of the three major religions. This one-god belief incorporates many of the Egyptian beliefs which were emulated by the Hebrews, Christians and Moslems. Such as the belief in a soul, a hereafter attained upon leading a righteous life, a Son of God (the Pharaoh), and after the worship of many gods, the apex of belief – one universal God. Not acknowledged by religious scholars and leaders is that eight of the Ten Commandments, and many others, were already followed by the Egyptians. But one of the greatest beliefs, the belief in a soul, originated with the first god of Egypt, Atum. Many people have assimilated this very complex belief as a natural part of their spiritual beliefs. However, very few people know where and when this powerful belief in a soul evolved. The Creation by Atum described Atum’s ka as being imbued into his creations. It is fair to reason that the concept of a soul, called the ka, was expressed by the Egyptian priesthood with their hymn extolling Atum’s creation. The idea of a ka had emerged before or during the life of King Ka, who existed a few generations before the start of the First Dynasty, which Egyptologist James H. Breasted dates as 3400 BCE. By the Sixth Dynasty, approximately eight hundred years later, the priesthood had incorporated the belief of the ka, or soul, in The Creation by Atum. The creation hymn reveals that all created things are protected by the ka of Atum. Let us visit the lines that state that this creator god put his own vital force into his first creatures. Thou didst put thy arms about them as the arms of a ka, for thy ka was in them. To be endowed with an internal force or spirit called the ka from the creator god Atum had a spiritual significance. This vital source must be what gave the created object its unique characteristics or its special force. Scholars of Egyptian history believe that the ka represents the alter ego, a guardian spirit, or the vital force of personality. Since the god Atum puts his ka into his creations, it identifies their unique characteristics and attributes. That is, the ka provides those attributes that uniquely form the totality of a living or material substance. In essence, the ka represents the total makeup of glandular, physical, and mental functions that defines humans and their personality. I diverged from Figure 1 after indicating that it was Moses’ Book of the Covenant that led to the development of the Torah, also referred to as The Five Books of Moses. It was the Judaic religion that gave birth to the Christian religion and how that evolution occurred has been documented in the two Amen books mentioned above. It was Jesus Christ, a man of God, who referred to himself 76 times in the four Gospels as the Son of Man. He announced a revelation in The Revelation of Saint John that Judaic, Christian, and Islamic religious leaders have not acknowledged throughout the centuries, and continue to be silent even today. In Revelation 3:14, Jesus proclaimed Amen as, “the faithful and true witness, the beginning of the creation of God.” It is not my interest to change or debate your beliefs for our minds are made up with many different inputs that form our intellect and views. I only desire to present what I have learned for your own evaluation. By comparing your instilled values with new information, you may be able to have a greater appreciation for differences that exist and resolve them with logic. By reading the referenced Amen books, you can gain information to assess and determine if Jesus has indeed provided a revelation for all of us to examine and evaluate as being true. Much of what I have written in this article may be new to you and therefore difficult to absorb. Beliefs that have been ingrained into our lives are very difficult to analyze with logic. But only with facts and findings from the past can we surface the truth. I will be honored to answer any questions or comments about the contents and findings of this article. Do not hesitate to provide a comment, pro or con; for by presenting our views we will be able to reach a higher level of truth. Hopefully, such greater understanding will bring peace of mind to those who have conflicting beliefs that need to be resolved. Before I leave you with an extract of a paper published by the Chute Institute, I would like you to reflect on the main themes presented in the book trailer for Amen. There is a need for high school, college, and university educators to introduce their students to a history of mankind’s development of religions and beliefs in God. Regarded as too sensitive a subject, students are deprived of learning how mankind has evolved ways to establish moral and righteous behavior to maintain harmony among competing groups within a growing community. Based upon facts and findings surfaced by such respected Egyptologists as James H. Breasted and E.A. Wallis Budge, this author conclusively reveals how the first formal religion of Egypt has been emulated by the Judaic, Christian, and Islamic religions. Historical findings provide meaningful evidence of the spiritual nature of man, the emergence of one God Amen, the development of the concepts of truth, a soul, hereafter, Son of God, and a universal God. These findings afford greater insights in the fields of theology, humanities, psychology, and sociology studies. More importantly, a greater understanding of the nature of man can energize religious leaders and the public to effect possible solutions with the assistance of those with perceptive minds and love of humanity. Many people have a fear of Muslims due to mass killings by terrorist extremists in America, France, England, and Germany, to name a few countries whose culture and way of life are being threatened. Muslims are human beings that have the same feelings, wants, and desires that other people have but there is a difference. It is their value system and sense of morality that is different. It is driven by an ideology set in the Qur’an and implemented by Sharia law. The impact that these Islamic documents have on the Muslim people requires a brief history of Islam’s history, which is presented in the novel Allah, We, Our and Us. It reveals that from the very beginning of its inception, Islam instilled an ideology that causes the Muslim mind to believe that Islam is the “Religion of Truth” and that Allah will “make it prevail over every other religion” (Qur’an 9:33). Muhammad’s revelations were complied by his Companions to assemble the Qur’an. It was used to unite the many Arab tribes with a unified belief in One God, Allah. But religious leaders forced this belief by conquering many people in other countries. History verifies that they established a Theocratic Empire by 750 CE by taking the land and wealth of conquered countries. Indoctrinated with the belief that Islam is the religion of truth and shall prevail over every other religion (Qur’an 9:33), Islamic armies forced people of conquered countries to submit to Islam with just three alternatives, complete allegiance to Allah, pay a tax to survive with your own beliefs, or die by the sword. The belief that Islam will prevail over every other religion promotes a sense of superiority over worshippers of other religions. A superiority that is similar to the German indoctrination that they were a master race, which ignited WWII and the mass murder of millions of Jews. What insidiously transforms Muslim minds is that this belief associates them with Allah. The novel, Allah, We, Our and Us reveals that throughout the Qur’an Allah is referred to as “We, Our and Us.” It causes Muslims to subconsciously associate themselves with Allah, which creates a feeling of unity with the Creator and the compulsion to impose this unity on all people with the altruistic belief that they are promoting the integration of mankind with the Creator. This compulsive belief is indoctrinated into many Muslims whereby they want to impose their religion on all people in the name of Allah. The outcome of this ideology has caused the deaths of over 3,411 American civilians, firemen and law officers due to Muslim extremists that flew planes into the New York twin towers and Pentagon on September 11, 2001. As revealed by Islam’s past history, it is this Islamic ideology, embedded in the Qur’an, that has caused the destruction of many towns and cities of many countries. Contrary to the pronouncement by President Obama that Islam is a religion of peace, history reveals this is a lie promulgated on the American people. After the death of the prophet Muhammad in 632 CE, Islamic armies conquered many lands to become an Islamic Empire by 750 CE. Muslims conquered the Byzantine and Persian empires, and along the Mediterranean, across Christian lands and as far west as Spain, they conquered all of North Africa, which included its east coast down to the island Madagascar. This conquest extended further east to the northern half of India. Islamic conquests were never through peaceful means; conquered people were forced to convert to Islam, pay a tax to survive with their own beliefs, or die by the sword. Figure 1 illustrates the expansion of the Islamic Empire throughout the Eastern world by 750 CE, a period of only 118 years after Muhammad’s death. In today’s world, President Obama’s lie becomes sadly relevant as the ideology of Islam has grown like a cancer and has become a threat to all freedom loving countries. Figure 1. The Theocratic Islamic Empire by 750 CE. 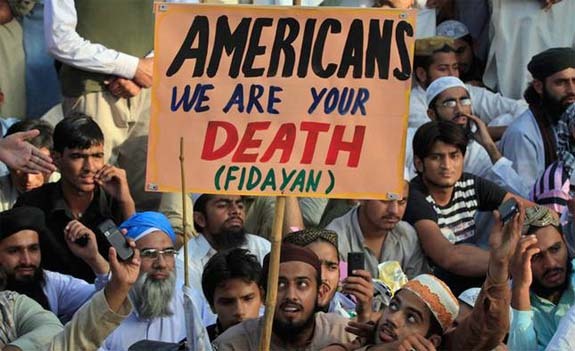 Americans and people around the world are starting to wake up that the ideology of Islam produces Islamic extremists with an objective to dominate the world. On October 31, 2015, Russia felt the arm of the Islamic State of Iraq and Syria (ISIS) reach out by downing a Russian plane with a bomb over Egypt’s Sinai Peninsula killing 224 people. A series of ISIS planned terror attacks in Paris France on November 13, 2015 caused the brutal murder of 141 people and wounding 352. A day after the Paris attack, France declared war against ISIS and launched its biggest bombing raid in Syria. On December 2, 2015, a terrorist attack by two Islamic Muslims killed 14 and injured 21 people in San Bernardino California. This stunned the American people even though it was not as lethal as the 9/11/2001 terror attack, which caused the deaths of more than 3,400 Americans. These terror attacks make it very clear that it is the ideology presented in the Qur’an, implemented with Sharia law, that has transformed the minds of Muslims to exhibit bigotry, hatred, violence, and the killing of innocent people. Due to their ideology, wherever Muslims migrate, such as England, France, Germany and Belgium, they are unable to assimilate the values, civic laws, and culture of another country. Figure 2 illustrates the ideology of the Islamic religion is to prevail over every other religion and eventually dominate the world. This ideology leads Muslims to reject the norms, values, laws, culture, and morality of another country. The Qur’an incorporates an ideology that runs counter to the American Constitution and the freedoms of many democratic countries. Figure 2. Islamic ideology seeks to establish religious dominance. To examine many of the passages that cause many Muslims to become bigoted, hateful of those that follow another religion, resort to violence when the Qur’an or prophet is slandered, and murder people who have religious beliefs refer to the novel Allah, We, Our and Us. It is presented as a FREE read on the Iran Politics Club website. It is the passages in the Qur’an that infect unsuspecting minds to be totally committed to their god Allah. To assist the reader to understand the ideology of Islam, a highly respected translation of the Qur’an has been provided by the Honorable Muhammad Zafrulla Khan, published in Great Britain by Curson Press Ltd in 1970. Those of you who desire to read the sura verses in full should obtain a copy of the Honorable Zafrulla Khan translation. It would serve as a superb reference of the Qur’an because it is one of the earliest translations that has not been altered to be politically correct. Islam is not a religion of peace. No other religion but Islam advocates in the Qur’an that Islam will prevail over all other religions. Islamic religious leaders MUST revise the Qur’an to eliminate its abominable ideology. If the Qur’an is NOT revised, Americans should shut down mosques and exclude Islam as a religion in the United States. This Islamic ideology threatens all religions in the United States and around the world. The U.S. must prohibit any Muslims to enter the United States if they insist on following the Qur’an and Sharia law. It would be foolish to endanger the safety and lives of Americans with an influx of Muslim immigrants when the United States is threatened by an Islamic ideology that is incompatible with its own constitutional laws and undermines the existence of other religions. There is a Solution for Islam to be Accepted by All Countries. >> To revise the Qur’an is No Easy Solution. But only by revising this holy book can change occur. >> Islamic religious leaders MUST revise their Holy Qur’an. >>The only peaceful solution is to revise the Qur’an with God’s greatest command – Love one another. >> If Muslim leaders are unable to revise the Qur’an, then Muslims must replace them with compassionate, perceptive leaders to revise the Qur’an. To ignore this solution, World War III is inevitable. If abominable behavior cannot be changed with love, then the elimination of Islam is the only alternative. To STOP Islamic expansion the Qur’an needs to be exposed world- wide so that Muslims understand that the Qur’an Must be Revised. Initiate and spread a powerful advertising campaign with the resources of wealthy business leaders, financially endowed humanitarians, government agencies such as the FBI and CIA, and of course, the National Media in America. Many countries must join in such a communication campaign. Their objective is to inform people WHY Islam is a danger to peace-loving people and EXPOSE the Qur’an abominations. The link below provides conclusive reasons why the Qur’an must be revised. By exposing the many abominations of the Quran, people and Muslims around the world will become cognizant of the need to rise up against the established imams, mullahs, and caliphs with the objective to revise the Quran. Exposure of the abominable verses will reveal that the Quran is NOT perfect and that a Party of Men use the Quran to control and subjugate Muslim followers. They will learn that Islam has grown into a world religion not by acceptance of other people but by force taking their lands, wealth, and killing innocent lives. To avoid death by the sword, families were given the option to pay a tax to stay alive for not converting to Islam. Why an Islamic Reformation is needed is provided in the link below. Opposing reasons to revising the Qur’an are: Muslims are too ignorant to read the Quran; both moderate and extremist Muslims follow the Quran line-by-line; the Quran is forbidden to be revised; most educated Muslims have not totally read the Quran in depth to understand its true nature; indoctrination of many Muslims occurred at such a young age that education of other world and philosophic views cannot change their minds. Religious leaders have developed rules to have people live in harmony with one another. However, people should realize that religious beliefs are not cast in concrete never to change. As people become more knowledgeable about themselves and the universe they must also update beliefs and rules that were useful ages ago. The Egyptian Priesthood of Amon revised their religious beliefs many times. They advanced their beliefs from the worship of many gods to one-universal God. Modern man should be able to resolve the religious quagmire created by Islamic religious leaders who insist that the Qur’an is Perfect. Provide History of Religion and God? The author welcomes your comments and will respond to any concerns and questions. Debate and discussion is the best way to air differences and arrive at sensible and logical conclusions.